I'm just a little late...ok, a lot late, in writing about a really fun trip Luanne and I took to Asheville, NC. I had to go because my children were running in a track meet there, so I talked Lu into coming with me. We had such a good time catching up and spending time together. While we were in Asheville, we managed to squeeze in some fun in addition to the track meet. We toured the Biltmore Estate, which was built in the 1880's by George W. Vanderbilt, grandson of Cornelius Vanderbilt. The Biltmore mansion is huge and the grounds are immaculate. Both Lu and I had visited before, but we were still amazed. All seasons at Biltmore are beautiful. There is no bad time to visit, but this particular visit was in spring and the tulips on the grounds were in full bloom...absolutely gorgeous! We ended up missing the tour of the home itself, because of the track meet. The meet was, after all, the reason we were on this excursion, so we had to go watch the boys run. We did, however, get to eat lunch at the Stable Cafe on the grounds and we spent a lot of time exploring the greenhouses and nursery. While I didn't get any pictures of our food at the Stable Cafe, I can tell you that our meal was delicious and the restaurant is beautiful. We sat in one of the booths in an old horse stall. Very cool. One of the best parts of our meal was the dessert sampler we shared. We both agreed the Key lime coconut pie was exceptionally tasty. We also had fun taking the wine tasting tour at the Biltmore. The Biltmore winery, started in 1971 by Cecil Vanderbilt, grandson of George W., is the most visited winery in the country and the wines produced there have won countless awards and medals. We enjoyed hearing the history of the winery, the Biltmore and the Vanderbilt family. In addition, to roaming around the grounds of the Biltmore, we also made time to stroll the streets of downtown Asheville. Asheville has an artsy, bohemian sort of personality and it is lovely sitting on the banks of the French Broad River and tucked into the backdrop of the beautiful Blue Ridge Mountains. Asheville is home to one of the largest collections of Art Deco architecture outside of Miami. 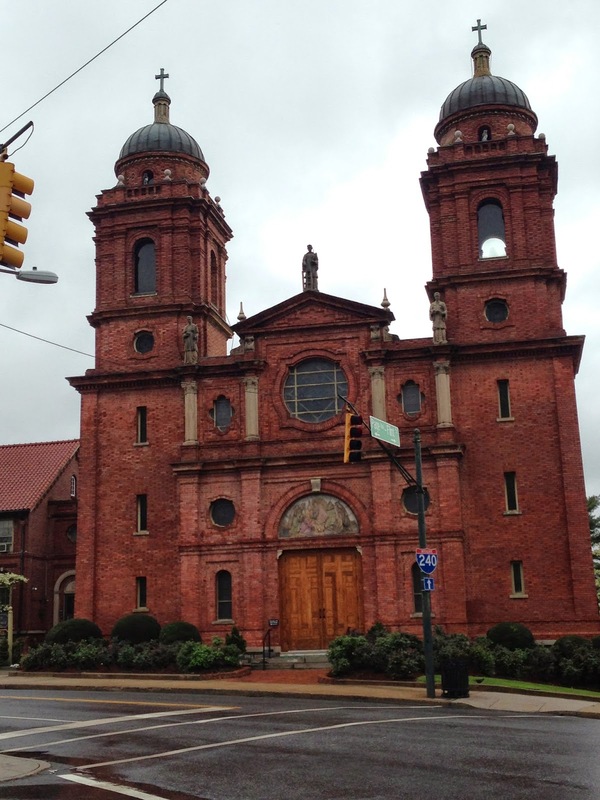 The only Catholic basilica in the state of North Carolina is located in Asheville. Lu and I found the Basilica of St. Lawrence to be exceptionally beautiful. It was designed and built in 1905 by a Spanish architect and has definite Spanish characteristics. We also happened to run into this nun in downtown Asheville. She turned out not to be a she! In fact, "she" was part of a comedy bus tour. We were wishing we had time to take that tour! Since we were in town for three days, we did have time for a couple more meals before we left town and we also found the bar of our dreams. Let me explain. For dinner we chose a tiny little restaurant with a colorful attitude. 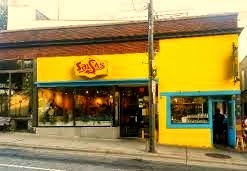 The name of this place that so captured out attention was, Salsa's. Now if you know anything at all about me, it is that I have a weakness for salsa of almost any kind. Give me a salsa bar and I'm in heaven. No, that is still not the bar of our dreams previously mentioned. I'll get to that later. Anyway, back to Salsa's. It was billed as a Caribbean/Mexican restaurant. That is all it took for Lu and me. We love Mexican food. We love island food. We love anything tropical. How could we resist? Salsa's was the perfect choice for us! We knew that when we squeezed inside the front door and found standing room only. That's always a good sign, right? The tables in the tiny establishment were squeezed tightly together and we watched platter after platter of delicious looking creations being carried to each table. By the time we were seated, we were ravenous! We started with this delicious bowl of homemade chips and three yummy salsas. It tasted even better than it looks. Then we shared this outrageous combination of sea bass, plantains, sweet potatoes and beans. The combination of fish, veggies and salsas was out of this world. We had to resist picking up the bowl and licking it clean! Now about that bar from heaven. No, it is not what you are thinking. This bar was totally CHOCOLATE! I am not kidding! The French Broad Chocolate Lounge, named after the local river, is ahhhhmazing! We walked through the door and our senses were overloaded with chocolate choices....chocolate candy, chocolate cakes, chocolate drinks, chocolate, well, you get the idea. Think Bubba Gump but with chocolate. This place was so good, we visited twice! Oh, and if the aroma of chocolate and the taste of chocolate weren't enough, there was a jazzy, bluesy little band to smooth out any stress that had not already been melted away by all the chocolate. 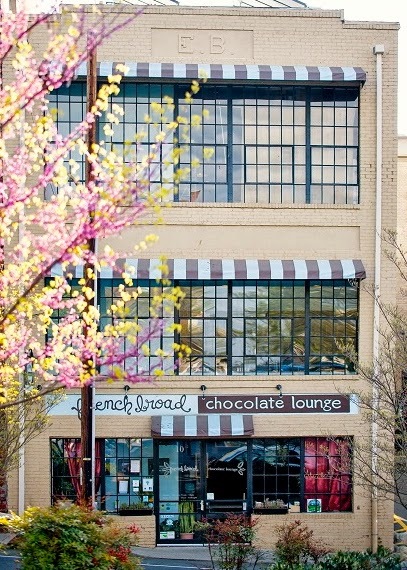 Our trip to Asheville would have been totally worth it if we had only had time to visit the French Broad Chocolate Lounge. And to drink? Chocolate, of course! On our last day, right before we left town, we stopped for one last meal. This time, our restaurant of choice had a sweet, particularly southern sounding name...Tupelo Honey Cafe. The cuisine at Tupelo Honey is best described as southern soul, but with an artsy, Asheville twist. Do not go to Tupelo Honey if you are not hungry, because not only are the portions huge, they start you out with a big basket of delicious biscuits. After fretting over the mouth watering selections on the menu, I finally settled on shrimp and grits. The grits were creamy with goat cheese, the shrimp fresh and the red pepper sauce spicy, sweet and tangy. Altogether delicious. Luanne could not resist the frisbee sized buttermilk sweet potato pancake topped with spiced pecans and whipped peach butter. Her pancake was accompanied by crispy maple peppered bacon. That one pancake was enough to feed a family of four, but for those with extra large appetites, the Shoo-Mercy is a double stack. I cannot imagine anyone being able to eat two of those giant pancakes. If you did, you would definitely be begging for mercy! Our trip to Asheville was lots of fun and we left the beautiful Blue Ridge Mountains of North Carolina vowing to return. Next time we want Parker to join us. Every place we visited in Asheville got three whole-hearted Yums UP!